In this chapter the author analyses the main geo–morphological, climatic, flora and fauna characteristics of the surrounding environment of the archaeological site of Turdaş–Luncă. It is stressed that the settlement lies on the southern side of an active bend of the river Mureş and it is situated on a high terrace of the same river. Finally, it is concluded that in this area the Mureş had the utmost special economic importance in the development of the Neolithic and Aeneolithic communities from here. The author finds out that the settlement from Turdas in well-known in Transylvania after the year 1875 when the baroness Zsófia von Torma does some excavations at the place called “Luncă”. Otherwise, this baroness dedicated her entire life to the study of the archaeological material discovered in this site or in the one at Nandru Vale, studied in 1876. The activity of this research made the site from Turdaş become famous and this the barones Z. von Torma was awarded with the title of Doctor Honoris Causa of the University of Cluj. In 1910, Márton Roska made systematic excavations at Turdaş, this being given the opportunity to process and publish the collection from Cluj. In 1940, the site was studied by Octavian Floca and Vladimir Dumitrescu for several days and in the 1960's by Iuliu Paul. In the 1970's and 1980's Florin Draşoveanu, Tiberiu Mariş, Gheorghe Lazarovici, Zoia Kalmar-Maxim (from Romania) and John Nandris (from England) continued the research. The Neolithic and Aeneolithic settlement from Turdaş is situated on the banks of the Mureş at a distance of aprox. 250 m westwards from the last house in the village of Turdaş and aprox. 50 m northwards the railway route Deva – Orăştie. At present the settlement has a length of approx. 600 m alongside Mureş and approx. 80–100 m towards the railway. The site has been devided into 3 large areas: (plan 1): A = Central area; B = Western area; C = Eastern area. Towards the end of the eastern area, in point D a burial tomb has been discovered. In the central area we have marked and excavated the areas S1/1992–1993(plans III and V; size: 10 m length and 3–4 m breadth, in accordance with the winding of the banks of the Mureş; the dwellings are: mudhut B1/1992; mudhut B2/1992–1993; dwelling L1/1992 and dwelling L3/1992); S II/1994–1995 (plan II; size: 6,40 / 4,40 m; dwellings that were discovered are: mudhut B4/1995; dwelling L2/1994–1995 and dwelling L4/1995) and the square excavation C3/1993 (plan IV c; size: 3,5 / 1 m; dwelling: mudhut B3/1993). In the western area we have marked and excavated the square excavations C1/1993 (plan IVa; size: 4 / 3 m; a hut was discovered, belonging to the Coţofeni culture) the square excavation C2/1993 (size: 4 / 3,5 m; a dwelling belonging to the Petreşti culture was discovered, not numbered), the square excavation C4/1994–1995(plan IVd; size: 4,70 / 4,70 m; a dwelling belonging to the Petreşti culture was discovered, not numbered) and the square excavation C5/1994–1995(size: 4,5 / 4,5 m; the Petreşti dwelling L5/1994–1995 not entirely studied). § level I (central area; plan I, point A) belonging to the Turdaş culture. The main archaeological grounds of the level are the mudhut B1/1992 and the mudhut B2/1992–1993. § level III (central area; level III from the western area) has the surface dwellings L3/1992, L2/1994–1995 and L5/1994–1995, belonging to the Petreşti culture, as most important architectural grounds. In the western area (plan l, point B) it also appears a level III, with dwellings the type of a hut, belonging to the Coţofeni culture. In area D (plan I, point D) it was discovered the tomb of a child who was crouched on the floor of a deepened dwelling, headed North-South with his face towards the East. The child must have buried at an early age (plan lVb). 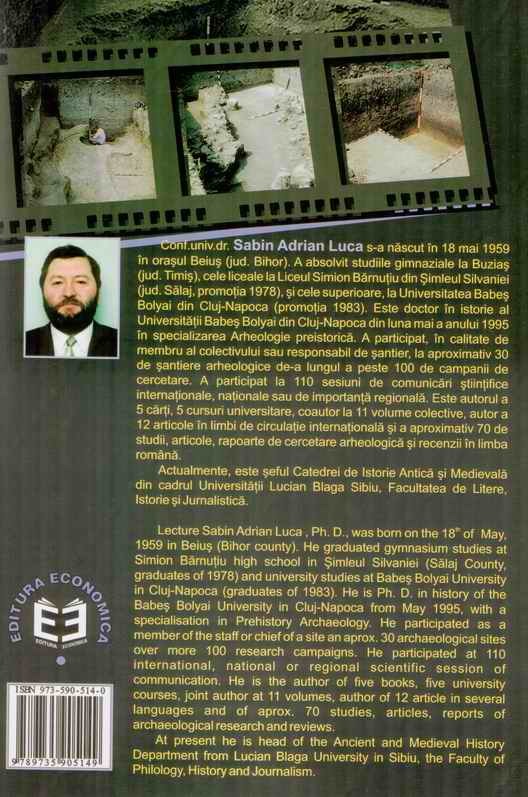 The description of the archaeological materials is done on the cultures represented in the settlement at Turdaş–Luncă. A) Turdaş culture. The main pottery categories are the fine one, the semi-fine and customary one. The main aspects are the ones from the drawings I–III. The most frequent ornaments are the ones in the characteristic style of the Turdaş culture (marked belts filled with short marks). The most interesting ornaments are made through painting in red, yellow or white colour before burning the pottery or black-bitumen after burning it. Some clay figurines, and a slate with marked signs on the bottom were discovered there. B) Petreşti culture. The dwellings belonging to the Petreşti culture that had been studied between 1992–1995, are not that representative for the culture. The main aspects can be found at drawing lV. The materials discovered between 1996–1998 are much more representative, but these are to be published in the second volume dedicated to this site. C) Coţofeni culture. The remains of this culture are rare. The main aspects are published in drawing V.
First of all, the author shows the chronological and cultural place of the Turdaş culture inside the South-Eastern European realities, not agreeing with the existence of such cultures or mixtures of cultures such as the Turdaş–Vinča or Vinča–Turdaş culture. This is why the author presents the main early Vinča discoveries from Transylvania, these being almost identical with the ones in Banat or Serbia. Characteristic for Transylvania is the fact that this early phase, belonging to the Vinča culture, developed over a much longer period of time than the rest of the cultural territory due to some special factors. Further on the author presents that in Transylvania existed a tendency of development towards the technology of Linear–Pottery cultures in some settlements. Further on, the author shows that the high Neolithic in Transylvania is almost unknown because in his opinion, the cultural group called Cluj–Cheile Turzii–Lumea Nouă–Iclod has not been sufficiently studied to cover this period in a satisfactory way. The Turdaş culture is defined in the following lines as a resultant of the penetration of some early Vinča C elements in Transylvania and the transformation of the Transylvanian cultural environment in this sense. The time of penetration cannot be earlier than the end of the B2 phase of Vinča culture. The archaeological materials from old discoveries at Turdaş–Luncă are seldom characteristic for the Turdaş culture, the old collection being, in all likelihood, formed of archaeological material taken from several sites on the Mureş Valley. The author insists on the existence of a possible Hamangia import and several imports of the Precucuteni culture in Turdaş. The next lines focus on a detailed analysis of the bitumen painted pottery from the Turdaş culture (the painted type called Tăualaş). The author believes that the painting technique comes from the Salca–Herpály culture through the Foeni group from Banat or, following a diagonal, over the Apuseni Mountains towards Deva. With this occasion the author ascertains that it might be possible for painting-before-burning type of Lumea Nouă to come from the same area (North-West of Romania), but in an older chronological moment. Further on, for the chronological framing of the Turdaş culture, reasons are given through the existence of three radiocarbon samples made in the Debrecen laboratory, which give the year 5800 B.P., or 4700–4660 C of B.C. The Petreşti culture is situated in the Turdaş culture in it’s A–B phase, and the Coţofeni culture is situated in phase I. 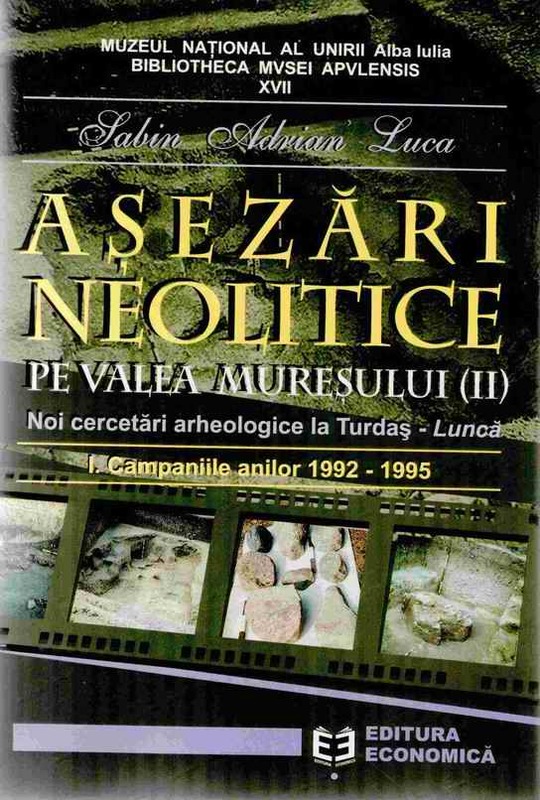 At the end of this volume, which represents the first part of the monography dedicated to the new archaeological research from Turdaş, the author tries to realise a comparison between the stratigraphy of the archaeological site of Tărtăria and of some other sites in the valley of the middle stream of the Mures (Turdaş–Luncă, Deva–Tăualaş, Orăştie–Dealul Pemilor, point X2 and Mintia–Gerhat).